Is your current Mono copier not keeping up with printing demands? The Lexmark MX822ade Copier may be the perfect device for you. Why suffer on speed of printing for quality when you can have both in one device. With an outstanding printing speed of up to 55 pages per minute your workload will never suffer again! Keep up with the fast paced business world and connect to the copier via Ethernet, USB, or simple mobile printing options. With a stunning print resolution of up to 1200 x 1200 dpi you can count on quality results every time. Are you tired of moving your current copier to deal with paper jams at the back of the device? Well there’s no need to worry with the Lexmark MX822ade as it has front access to the paper path and power button means you’ll virtually never have to access the back of the device. With re-engineered consumables including toner cartridges that now last up to 55,000 prints and a long life imaging unit and fuser unit, you’ll spend more time printing and less time fixing maintenance issues. Are you looking to boost productivity yet still have reliability from your copier? 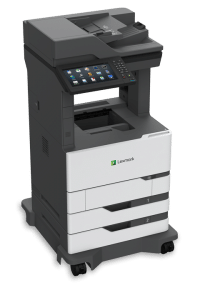 This new addition Lexmark copier may be the right fit for you.